No great strategy was born without careful thought. That’s why the process of planning a strategy itself is an important vehicle for setting priorities, making investment decisions, and laying out growth plans. But for many companies, the activity has devolved into either an overexplained budget or just bad amateur theater – lots of costumes in the form of analysis, charts, and presentations – but with very little meaningful substance that can be translated into action. As a result, many strategic plans end up as shelf decorations or hard-to-find files in crowded hard drives. Insist on experiments to test the assumptions you’ve made. Strategic plans necessarily involve hypotheses that certain outcomes (increased revenue, improved margins, higher ROI) will result from a given set of initiatives. But too often those assumptions are supported by secondary research, educated guesses, or assumptions rather than field tests. As a result, managers are uncomfortable actually moving into action or committing resources, preferring to stay with the business they know rather than possibilities that may or may not pan out. To overcome this inertia, ask managers to include specific, short-term experiments, whose results will communicate what works and what does not. In one company, the senior manager called these “scouting missions” and made sure that each of his managers was responsible for at least one every quarter. Banish fuzzy language. 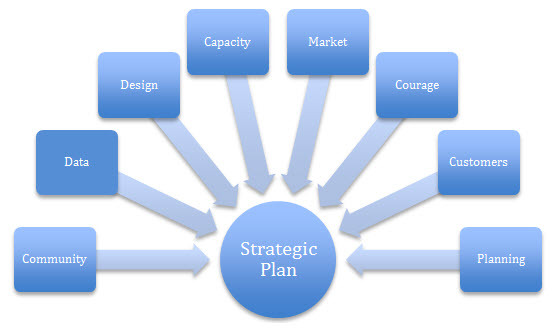 Strategic plans are often filled with empty phrases such as “Leverage our World Class Operating Capabilities” or head-scratching aspirations like “Reshape Our Pricing and Trade Strategy to Effectively Drive Demand While Maintaining Market Access.” Language like this can signal that a team doesn’t have a clear idea of what they need to succeed. To counter this dynamic, the CEO of a large financial services firm banned her organization from using a list of words and phrases such as “leverage” “synergy,” “disintermediation,” and “robust” (to pick a few of the most overused terms). Escape from template tyranny. Templates are often a standard fixture of strategic planning. Ideally they force teams to consider important topics – competitive analysis, shifts in external markets, performance gaps that need to be closed – and more easily compare data from different divisions. But the rigid use of templates can lead a team to be more focused on corporate requirements than on doing the hard thinking about how they plan to grow their business. And when teams have to complete the same templates each year, the result can be stale ideas, rote responses, and plans that don’t fully capture – or worse, obscure – the key issues and opportunities that a business needs to address. Avoiding this problem may be as simple as eliminating sections of the planning template that no longer make sense; or it may mean more radically changing the requirements. For example, a large food manufacturer re-energized the process by shifting from a 3 year planning template requiring many different and overlapping pieces of information to a shorter, more open-ended format that gave teams greater latitude to develop their growth plans in the form of a narrative. The strategic planning process is an important part of most organizations’ operating rhythm. The leadership challenge, however, is to make sure that it’s more than just a corporate exercise – or bad theater.